Hanks's parents divorced when he was very young, and he was raised by his father, a chef who often moved in pursuit of work. Hanks went to five different elementary schools, and grew up a shy child. He reinvented himself as a class clown in high school, and eventually took drama classes and began appearing in school plays. His first film was 1980's He Knows You're Alone, a deservedly forgotten thriller, and his crossdressing sitcom Bosom Buddies with Peter Scolari was cancelled quickly. His second film was Splash, a silly but sweet story of inter-species romance, with Daryl Hannah, and John Candy. For several years after Splash, Hanks continued as a comedic actor -- Big, The 'burbs, A League of Their Own. 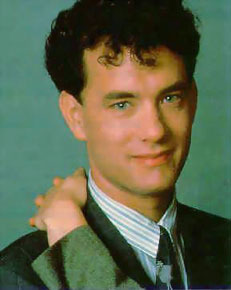 Hanks took more serious work in the 1990s, winning Oscars for Philadelphia and Forest Gump. He played astronaut Jim Lovell in Apollo 13, and was praised for Saving Private Ryan and The Green Mile. From Saving Private Ryan to Catch Me If You Can, he had seven consecutive films that broke the $100 million "blockbuster" barrier. He reportedly demands $25 million per movie. As a producer, Hanks delivered the top-notch HBO mini-series From the Earth to the Moon and Band of Brothers, and Nia Vardalos' indie hit My Big Fat Greek Wedding. He wrote, directed, produced, and took a supporting role in the rock'n'roll fable That Thing You Do!. In his next film, Hanks will play Charlie Wilson, the real-life Texas Congressman who was caught in a hot-tub tryst with two cocaine-snorting prostitutes, but was re-elected and went on to secretly supply funds for Osama bin Laden's Mujahadeen resistance in Afghanistan. Despite the perception that The Green Mile was a statement against the death penalty, Hanks says he has no problem with capital punishment. He campaigned publicly for anyone-but-Arnold Schwarzenegger in California's 2003 election for Governor, and Hanks has promised he will never seek elected office himself. In 2003, the contractor who built Hanks' remote, sprawling Idaho mansion and compound, including several guesthouses, filed a lawsuit to collect $1.75 million in allegedly unpaid fees. Hanks responded by threatening a countersuit, pointing out that their contract specified that any disputes would be resolved through confidential, binding arbitration, a clause specifically intended to deflect any potential for bad press. The court records were promptly sealed, the matter went to arbitration, and the following year a spokesman for the construction company said he was "thrilled" with the arbitrators' decision, but forbidden to comment further. Hanks was raised in the Roman Catholic church, but as a boy he also attended Mormon services with his stepmother and Nazarene services with his aunt. He has said that in high school he had "a serious born-again experience", and he joined the Greek Orthodox Church when he married his second wife, actress Rita Wilson. Hollywood Walk of Fame 7030 Hollywood Blvd.